* what size are you? add leather race suit Track Strap $14.99? add coolmax motorcycle socks $14.99? Yes, Keep My Feet Cool! MOTO-D Coolmax Motorcycle Undersuit w/ D30® Chest Protector wicks Moisture and Perspiration to keep you COOL. High Stretch Fit for Maximum Range of Motion. Full Length Two-Way Zipper, Comfortable Footstraps (keeps suit in position). Slide in and out of Motorcycle Leathers, Jackets, and Pants with Ease. Most Comfortable Motorcycle Undersuit specifically designed for Motorcycle Riding, will not Bunch Up or Separate like "Tight Workout Compression Gear". Perfect Fit "Guarantee", Unisex. Four (4) Sizes, Small to X-Large, color Black: (pick the smallest size possible for best fit, undersuits are high stretch, soft, and forgiving which is why they are comfortable and act like a smooth 2nd skin (vs. a tight compression "muscle" shirt). 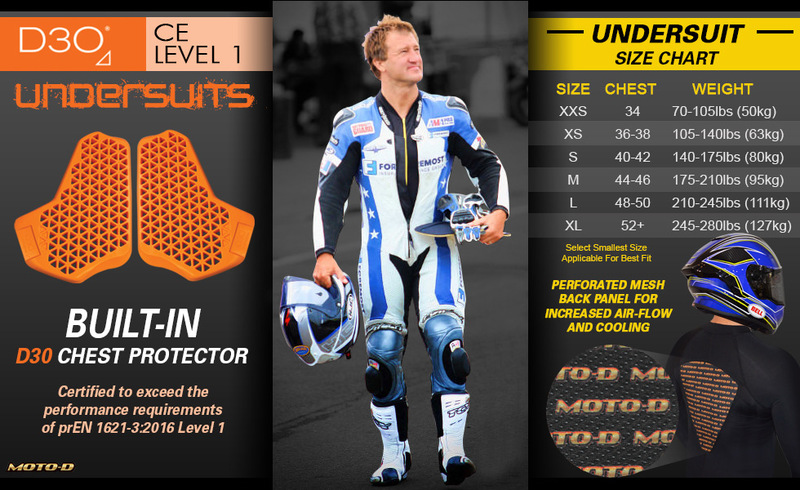 If you are in between sizes or +5lbs over (but under 6ft tall), please select the smaller suit size for best fit, contact info@motodracing.com for assistance with sizing. We guarantee perfect fit and return postage if not satisfied. Click the button below to add the MOTO-D "Cool-Tec" Motorcycle Undersuit w/ D30® Chest Protector to your wish list.